On the 200th anniversary of Jane Austen’s death, historian Lucy Worsley leads us into the rooms from which our best-loved novelist quietly changed the world. This new telling of the story of Jane’s life shows us how and why she lived as she did, examining the places and spaces that mattered to her. It wasn’t all country houses and ballrooms, but a life that was often a painful struggle. Jane famously lived a ‘life without incident’, but with new research and insights Lucy Worsley reveals a passionate woman who fought for her freedom. A woman who far from being a lonely spinster in fact had at least five marriage prospects, but who in the end refused to settle for anything less than Mr Darcy. 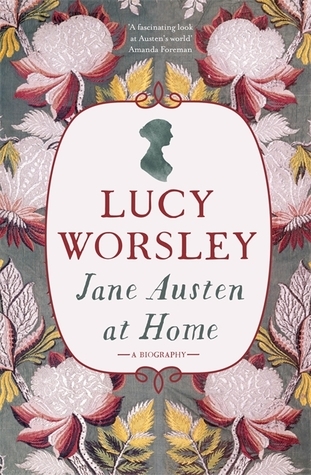 I think it was a foregone conclusion that I would really enjoy Lucy Worsley’s Jane Austen at Home. I have loved Jane Austen’s books for many years, going back to when I was about 12 and read Pride and Prejudice for the first time. I’ve previously read Carol Shields’s biography Jane Austen and Claire Tomalin’s Jane Austen: a Life so there was really very little I learned reading Jane Austen at Home that surprised me or that I hadn’t known before. I suppose what was new to me was the emphasis on what home life was like during the period of Jane’s life and seeing photos of the houses and places that she had lived or stayed in as a visitor. And I think I gained a better understanding of the social history of Georgian England and of Jane’s wider family connections and what her family and friends thought of her both as a person and as an author. Lucy Worsley is an historian and has presented several television history programmes. I am not a great fan of her style – the play acting and dressing up – but she writes in a lively, chatty style and reading her book I could easily hear her voice. Jane Austen at Home is both very readable and very detailed, which is not an easy thing to achieve. There is an extensive section at the end of the book, listing sources, a bibliography, notes on the text and an index. There are two sections of colour plates. Needless to say it has spurred me on to re-read Jane Austen’s books, and I shall probably begin with re-reading Emma, a book I’ve only read once. I received an e-galley from the publishers via NetGalley for review and part way through reading it I bought a hardback copy to get the finished product. Sounds good. I read one of her earlier books on the history of murder in fiction, and enjoyed it, though I’m not keen on her on TV stuff either. I managed to resist this one, but I’m now feeling very tempted…. I’ve been hearing about this one, Margaret. It’s always interesting to find out more about an author by looking at the times, and it sounds as though Worsley does that. Glad you enjoyed it. I’m not too keen on the play acting and dressing up either but generally speaking I do like LW’s docs. One on crime fiction was especially interesting a couple of years ago. This is on my TBR list and I have quite a few Janeite friends reading it at the moment. It is rare to find something both readable and detailed–I can taste it already!